I had been waiting for March 23, 2013 with eager expectation when the past and present Popes met together at the beautiful summer residence of the Roman Pontiff – Castel Gandolfo. This was the day that our Pope Francis, who took the name of the impoverished Saint of Assisi, spent time in prayer, gift exchange, private dialogue and lunch with his humble predecessor Benedict XVI. 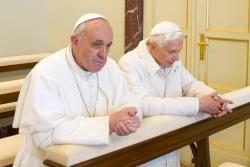 One of the things I noticed during their meeting was the frailty of Benedict XVI. Although I am sure of his mental acuity his body has really slowed down. This was truly evident when Pope Francis led Benedict XVI into the chapel for prayer. Pope Francis looked like a young man compared to the walking style and speed of Benedict XVI. My personal feeling is that Benedict XVI does not have many years left and the physical reality of age along with the weight of the See of St. Peter were part of the calculus as Benedict XVI prayerfully weighed his options. In relation to people in positions of power and influence, I have seen how easily people (fearing change & the unknown) prevail upon their leaders to remain in office longer then they should. It is in this moment that some of the greatest mistakes happen. Benedict XVI, with wisdom and in humility, gave up the See of St. Peter and all its trappings to retire himself to prayer, contemplation and his work as a theological scholar. The best part – Benedict XVI left the office untainted by personal scandal giving Pope Francis a good foundation from which to carry on the work that Christ (himself) entrusted to St. Peter. As I have previously written, Pope Francis has set a new course for his pontificate by embracing the poverty (especially of spirit) of St. Francis of Assisi. He has chosen to live out the faith in action, showing the world what it means to be the Bishop of Rome, the Vicar of Christ and Chief Shepherd of the Catholic Church. St. Francis would be proud and people have received this Pope as a breath of fresh air. Living the faith is contagious. Pope Francis’ living faith was evident in the meeting with Benedict XVI in three specific instances – which should be a lesson for us all. First, the initial greeting at the heliport when Pope Francis broke through the line of “officials” to come and greet Benedict XVI with a loving embrace and profound respect for his predecessor. Second, as Pope Francis led Benedict XVI into the chapel for prayer it was obvious to all that a special prayer rail was set up for Pope Francis directly in front of the crucifix and Icon of Mary. Naturally, Benedict XVI went to a prayer rail behind the Holy Father. Immediately Pope Francis reacted, moved to pray side by side with Benedict XVI even against Benedict’s strenuous objections. This interaction was profound in light of our human tendency to enjoy the accoutrements of power and authority. A thing Pope Francis does not seem to have much interest in. Refreshing! Finally, Pope Francis’ gift of a Russian Icon of the Madonna of Humility was profound. It had been gifted to Francis by representatives of the Patriarch of the Russian Orthodox Church. Pope Francis gave this to Benedict XVI as a sign and symbol of the humility with which he carried out his work as Pope. This sharing of such a significant gift was a real revelation of the depth with which Pope Francis lives out his vow of poverty and the connection he feels to his predecessor. There is a bond of love between these two men that we may never fully understand in light of their connection as the past and present Roman Pontiff. One of my take-aways as a Catholic is to see the papacy as a series of symbols pointing to the larger picture. 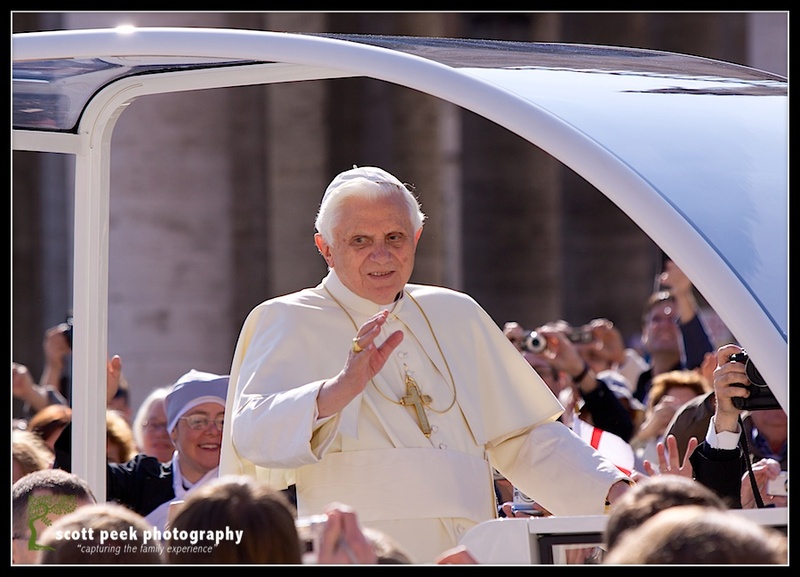 For me, the Popes are that living symbol of how we might be encouraged to live out our faith. In addition, the Popes help envision the faithful regarding the challenges to come. Therefore, if we pay attention we will obtain a blueprint for discipleship (at the individual level) and a vision to help shape our worldview. Hence, in Pope Emeritus Benedict XVI’s pontificate we saw both the call to interior / exterior renewal (a deepening of our spiritual lives) as well as a warning about the implications of a relativistic “faith” that is influenced by secular ideology and moral foundations of the non-religious. Both are important considerations for anyone who is seeking to understand what it means to be a disciple of Jesus Christ. In the pontificate of Pope Francis, the signs and symbols seem to be everywhere. However, I believe we must wait and see what the actual implications might be. This is going to be an exciting adventure. Maybe he will go and stay in the former convent with Holy Father Benedict much as he did with the retired Bishop in Buenos Aires? Either way I am glad someone else noticed the tenderness with which Holy Father Francis reacted to assertions that he should take the higher place. rue humility in action – he knew he could, but saw no need. Wonderful example. I agree that “signs and symbols are everywhere”. We must be careful not, too quickly, to read our own wishes and prejudices into these many signs and symbols. We must hope in the meaning of these signs and prayerfully do our very best to read this new Papacy and follow its leadership.